During the summer when farmers markets are open and fruit is at its peak, Sean and I love to make fruit crumble. Since we have a freezer full of Klassen Blueberries, we thought it would be fun to adjust our traditional crumble and share this recipe on CTV with Arms Bumanlag. This recipe is adaptable and can be made gluten free. I also used coconut sugar in place of refined white sugar and decided to experiment a little by adding Canadian Club’s Dock 57 Whisky. Adriano has been using it when making Caesars and Iced Tea cocktails. It has notes of cinnamon, caramel and vanilla which lend a sense of warmth and flavour for this dessert. Perfect on a cold, polar vortex kind of night. This recipe makes 1 small baking dish which is just enough of a dessert for Sean and I.
Preheat your oven to 350°. Line a baking sheet with parchment paper or foil. 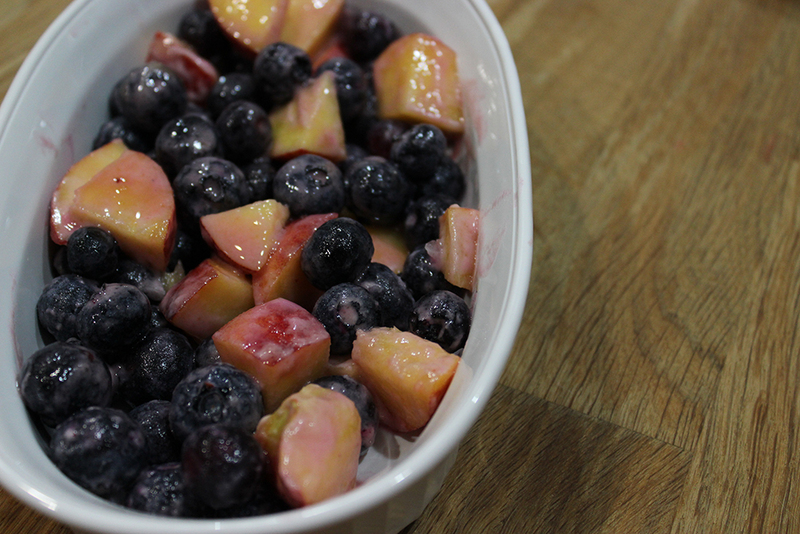 In a bowl, gently toss together the blueberries, peaches, lemon juice and zest, whisky, flour, coconut sugar, and salt. Set aside. In a separate bowl, whisk together the dry ingredients. Add in the butter. Using your hands, pinch the butter into smaller pieces. You want the butter and flour to have a coarse, crumbly texture. Pour the blueberry and peach mixture into a small baking dish and top with the crumble. I love a good crumble so I tend to load up…is there such a thing as too much crumble? Place onto the lined baking sheet. Bake for 30-45 minutes until the top is bubbling and golden brown. Let cool for 5-10 minutes. Serve warm with a side of vanilla ice cream of course.